Vegan creamy pasta in spicy avocado sauce, topped with caramelized mushrooms, onions, snow peas, crunchy radish and juicy tomatoes. After making the delicious Garlic Shrimp Pasta, I decided to make a healthier vegan alternative to make this pasta dish. 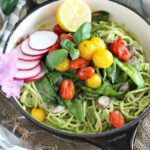 This Vegan Creamy Pasta will satisfy your hunger, while its still light on your waist due to all those amazing veggies. I absolutely love the taste of the delicious Veggie Pasta in combination with all these beautiful veggies. The creamy avocado sauce is definitely a staple in our house, made with roasted jalapenos and garlic. Because the sauce is flavorful and fragrant. In addition, I am a huge fan of caramelized mushrooms. 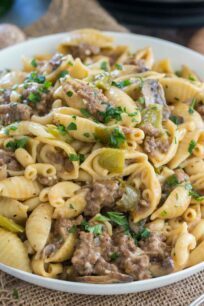 They add the perfect amount of chewiness and earthiness to this Vegan Creamy Pasta. Also, they compliment nicely the caramelized onions. The snow peas and radishes add such a fun crunch and a beautiful rainbow of colors to the dish. 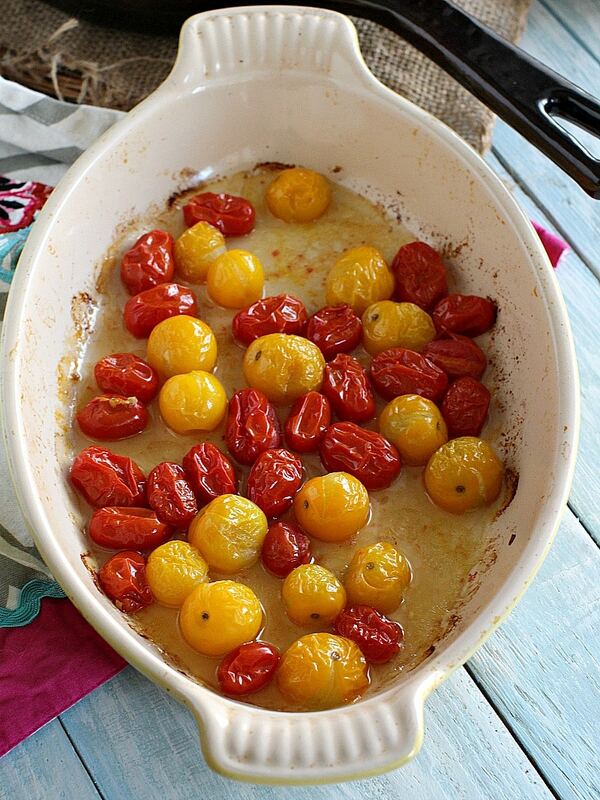 The juicy tomatoes are the perfect sweet finish. You can totally go ahead and sprinkle some grated fresh Parmesan on top for some cheese action. I kept this version vegan, as it was perfect this way. Firstly, it’s bursting with flavor and coated in the most delicious avocado sauce. 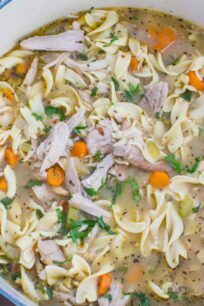 A perfect weekend meal and incredibly easy to make in no more than 20 minutes. Also, its vegan and perfectly healthy. In addition, it’s a perfect alternative to eat regular pasta. White wine usually pairs well with this dish. For example, Sauvignon Blanc or Chardonnay would be ideal wines to use for vegan pasta. This is your go-to category. If possible, choose a wine that has a moderate alcohol content, preferably between 10 and 13 percent. Grease a medium baking dish with 2 tablespoons of olive oil, add the jalapenos, tomatoes and garlic and bake for 10 minutes. In the meantime boil the pasta per package instructions and start on sautéing the veggies. To a medium skillet, and 4 tablespoons of olive oil, once hot add the sliced onions, cook for 3 minutes and add the sliced mushrooms and snow peas, cook for 7 minutes, stirring occasionally and seasoning with salt and pepper. Add baked jalapenos and garlic, 2 tablespoons of olive oil, avocado, basil leaves and lemon juice to a food processor. Process until creamy, season with salt and pepper. 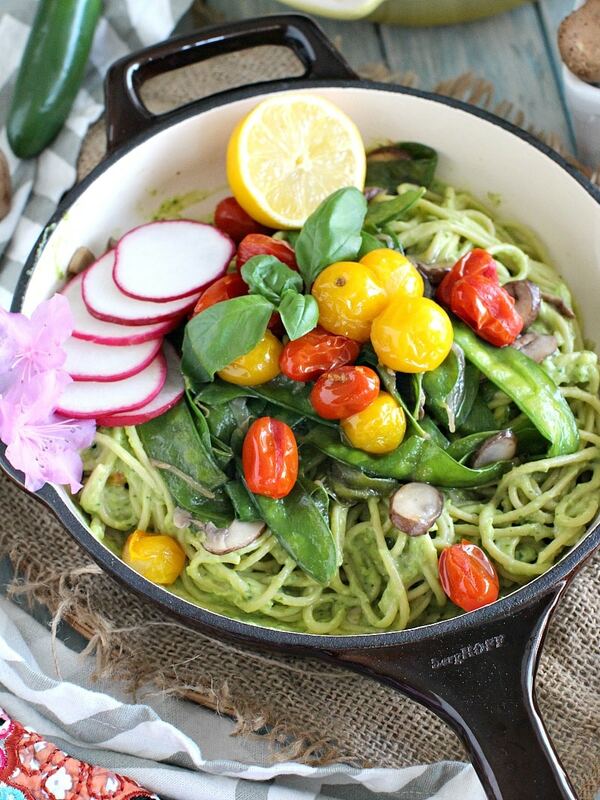 Drain pasta, mix with the avocado sauce, top with sautéed veggies, sliced radish and roasted tomatoes and serve. That pasta sounds so delicious, and OMG – all that delicious & healthy saucey, veggie goodness is calling my name. I want this for dinner! This pasta looks amazing!! Especially the avocado sauce! I just bought a whole bunch of avocados, and this looks like the perfect way to use them. Oooh this is totally my kind of recipe! 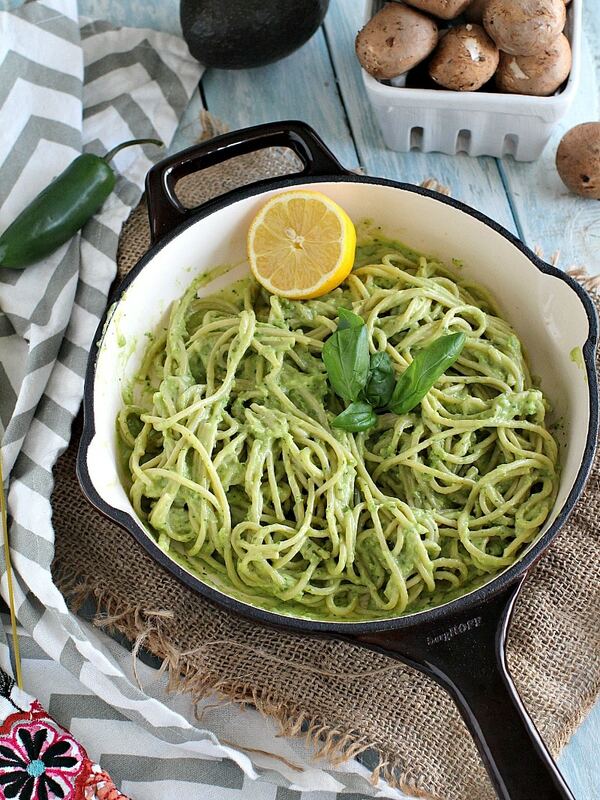 I love the colors and I bet that avocado sauce is so creamy and delicious! I’ve gotta try the veggie pasta — sounds awesome! Your recipe calls for SUGAR SNAPS, but you show SNOWPEAS in all of your photos. Was that intentional? I love both veggies! When I make this, I may use them boyh. 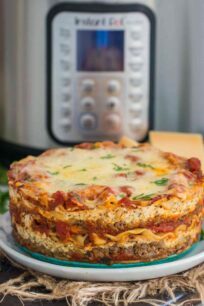 Is this recipe good reheated? I usually make lunch the night before and microwave at work. Looks delicious! can you use veggie noodles?